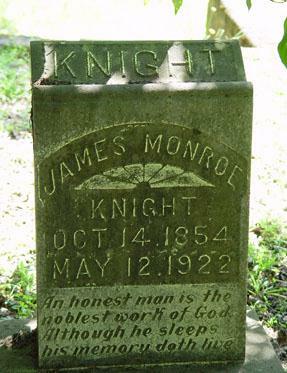 James Monroe "Roe" Knight, son of Nancy Knight, husband of Eliza Jane Abernathy. Eliza Jane Abernathy, daughter of Daniel Abernathy and Sarah Coley, wife of James Monroe Knight. Roe Knight died last Friday morning at his home on the Etowah River. The body was carried from the home Sunday afternoon, at 2:30 o’clock to Macedonia Church, and after a simple funeral service, conducted by Rev. 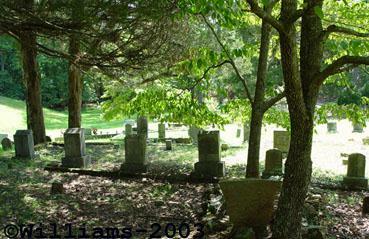 John E. Barnard, the body was laid to rest in the nearby graveyard. Thus, there passed away and was buried one of the county’s best known citizens; a man who lived a life of simplicity, amid scenes he had known since boyhood. A large number of friends gathered at the home and accompanied the body to its last resting place; sorrow was deep and genuine over his passing and many there whose hearts ached when the news of his death became known early last Friday morning. Mr. James Monroe Known, known to scores and scores of people as “Roe,” had suffered for the past eight weeks being stricken first with erysipelas, and later with pneumonia, which caused his death. Just before the end, realizing that he was soon to go, he called members of his family to his bedside, told them he had made peace with his God, and was ready to go. He requested that the funeral service be preached by Rev. Mr. Barnard, a man whom he admired and appreciated for many years, he told those about his bedside. He also selected from among his wide circle of friends the pallbearers, who were Messrs. J.E. Barron, of white, Hiram Hayes, of Adairsville, W.F. (Barney) Wallace, W.J. Weinman, Hamilton C. Stiles, John T. Norris. Mr. John W. Jones had charge of the funeral arrangements and carried them out in the simple unostentatious manner requested by Mr. Knight. Born near the old Cooper Iron Works, October 14th, 1854, he lived all his live in that section of the county. 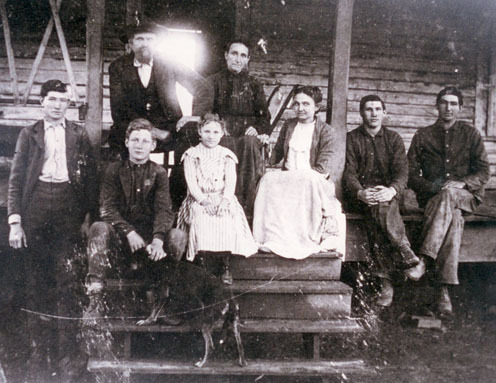 As a young man, he did considerable prospecting for the mineral properties, and it is said he located some of the most valuable mining sites now operating in Bartow County. When the Bartow Lumber Company began operation on the Etowah in 1906, Mr. Knight was placed in charge of construction the tram-roads need by the company and built over fifty miles of roadway. He was a man of unquestioned integrity, his advice and counsel being sought on many occasions when facts in connection with lands along the Etowah were needed. Of a quiet unassuming nature, he was not a man to place himself in the forefront, and naturally did not get credit for what he deserved, oftentimes. He was devoted to his family, and when his son, Wesley, was stricken with erysipelas, he took it upon himself to nurse him back to health. It was while attending him that the father contracted the malady, and when pneumonia appeared, his otherwise strong body could not withstand the ravages of this fearful malady. When the news of his death became known, scores of friends gathered at the home and lovely floral tributes were sent. Before the body had left the home Sunday afternoon, many friends had called to view the remains. At 2:30, the procession started toward old Macedonia Church, the autos winding their way about the steep roadway, crossing bridges over Stamp Creek, and then the cars halted before Macedonia church, more than forty autos being counted during the afternoon. At the church were gathered friends from all section of the county. The service began with the singing of an old-fashioned Primitive Baptist Hymn, led by Rev. J.T. Abernathy, pastor of the church. Dr. Barnard read 14 verses of the 14th chapter of Job, and preached the funeral sermon from Amos, the fourth chapter, and the twelfth version: “Prepare to meet thy God.” His words were those of comfort to the bereaved family, and a solemn warning to everyone person that they, too, must someday meet God. The sermon was one of particular appropriateness, and Dr. Barnard was listened to with the closet attention of the entire congregation, which filled the little church to overflowing. Some heard it by standing outside at the several windows. After the sermon had been conducted, the casket was opened, and before it passed all present who desired to get a last view of one whom they had known for so many years. The body was then carried to the graveyard, about a quarter of a mile distant, and there the body was consigned, “Earth to earth, ashes to ashes,” Dr. Barnard saying the last words at the grave. Then the men present began throwing the dirt back into the grave, and Roe Knight was left to sleep with his fathers, who have gone before him, and who rest in the same everlasting hills. Forty seven years ago Mr. Knight was married to Miss Abernathy, and to this union were born four sons and three daughters. They are Miss Mollie Knight, Miss Lula Knight, Mrs. Lucy Crisp, Mr. J.A. Knight, Mr. W.S. Knight, Mr. J.M. Knight, Jr., and Mr. Wesley Knight, all of whom, with their mother survive. A brother, Mr. J.T. Knight, and one sister, Mrs. Mary Brooks, of Texas, also survive, together with several grandchild, nieces and nephews. Bartow County has lost a good citizen and the family a devoted husband and father. Since it is impossible to thank everyone personally for the many deeds of kindness shown us during the illness and after the death of our beloved father, J.M. Knight, Sr., we take this means of expressing our sincerest thanks. We want all of you to know you have a tender place in our heart; we can never forget. Children named only by initials are William, James and Joseph. Funeral services were conducted Wednesday afternoon at two o’clock from Macedonia church in the Stamp Creek district for Mrs. Eliza Jane Knight, widow of the late Mr. J.M. Knight, a pioneer citizen of Bartow County. Rev. H.C. Cowart, pastor of the church, was the officiating minister. Mrs. Knight, though ill for several weeks, had an alert mind, despite the fact that she had reached the ripe old age of eighty years. The end, which came Tuesday morning, although a great shock to relatives and friends, was not unexpected. “Never Grow Old,” a favorite hymn of the deceased, was sung at the service by the church choir. At the grave, a quartet composed of Messrs. Gus Amos, Paul Gilreath, Paul Howard and John W. Jones, sang “Where He Leads Me.” Interment was in the churchyard cemetery with the following gentlemen serving as pallbearers: Messrs. Harry Galt, Carl Leachman, Ernest Knight, Leonard Gross, Eli Park and Carl Culver. John W. Jones funeral director was in charge. 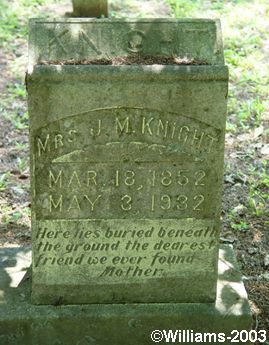 Mrs. Knight had been a resident of Bartow County practically all her life. She was a member of the Macedonia Church, and was a devout Christian woman, always working willingly in behalf of the church. She was a leader in her community, loved and respected for her fine qualities by legions of friends. Her husband passed away several years ago. Four sons, Messrs. Jim, Joe, W.S. 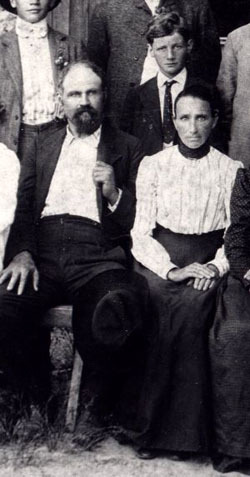 and Wesley Knight, and three daughters, Misses Mollie, Lucy and Lula Knight survive. The scores of friends of the bereaved family sympathize with them in their great sorrow, and mourn with them the death of this good woman.